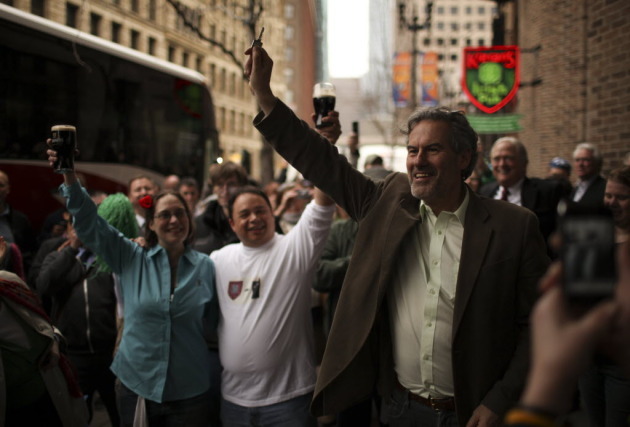 Kieran Folliard has left the building. One of the most famous faces in the Twin Cities bar scene says he has sold his stake in the four pubs he co-founded: Kieran’s Irish Pub, The Local, Cooper and the Liffey. Why? Folliard wants to go into the whiskey business full time. Earlier this year, he replaced much of the top-selling Jameson Irish Whiskey at his four pubs with his own brand, 2 Gingers. Now he wants to take his product out into the marketplace by selling it to liquor stores and other bars. But liquor laws prevent the ownership of both a distillery arm (he imports his brand from Ireland) and a retail outlet (such as a bar). Therefore, he has to leave his pubs behind. He said he anticipates that the move will be scrutinized, but insisted that his exit from the pubs is a “complete severance.” He informed the bars’ staff Tuesday of his departure. Folliard characterized the decision as being “extremely emotional” but said he’s restless for a new challenge. “It’s time to pass the baton,” he said. Folliard’s longtime business partner, Peter Killen, becomes CEO of the four bars and its umbrella company, Cara Irish Pubs. Folliard would not comment on the size of his buyout. Folliard said his decision came as somewhat of a surprise to his partners. “They thought I had been drinking too much of the product,” he said. But, he said, he left knowing the pubs were in good hands. In fact, Killen and the rest of the Cara team have been running the day-to-day operations of the pubs for some time. Folliard said bargoers will notice very few changes after his departure. Kieran’s at Block E will still be named Kieran’s — he thinks. “They might be down there changing the sign as we speak,” Folliard joked. As for his whiskey plans, Folliard wants to have his bottles on liquor shelves by late September. He also is thinking about dropping the “2 Gingers” name for something new. In the immediate future, he is working on the regulatory aspects of expanding his whiskey business. Currently, 2 Gingers is made in Ireland and bottled by Phillips Distilling in Minnesota. He said he also has hopes of taking the whiskey nationwide.